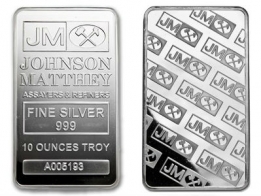 1 Kilogram Johnson Matthey Silver Bullion Bars. Each bar features the the weight, fineness and serial number of the bar on the front. Johnson Matthey was one of America's largest precious metals refineries, however the company was recently produced by Asahi. Therefore, Johnson Matthey silver bars are no longer produced. As a result, the premium on them has increased. They have become more popular amongst collectors in addition to investors. 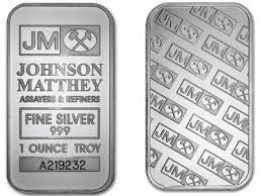 The front of each bar features the Johnson Matthey logo, with the weight and fineness of the bar located at the top. The bottom of the bar features its serial number. 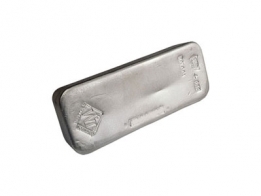 The 1 KG Johnson Matthey silver bar was brought out to target the European market, as all other silver bars produced by Johnson Matthey are in Ounce denominations. 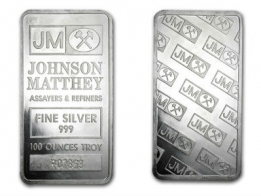 Johnson Matthey produce silver bars in 1 ounce, 10 ounce, 100 ounce and 1 kilo sizes. They also produce a gold bar in 1 ounce, 10 ounce and 1 kilo sizes.